It’s funny how one species gathers to stare at the other. 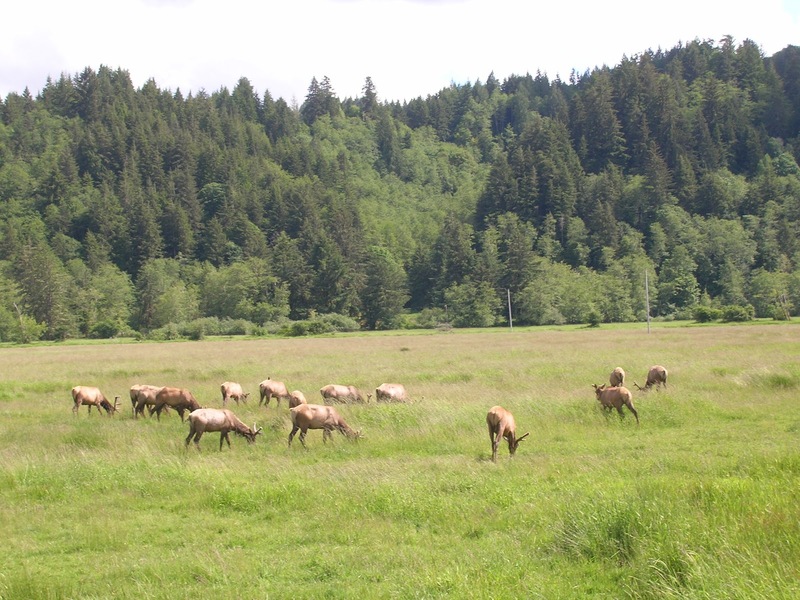 When you see a crowd of cars and people with cameras clustered together at Dean Creek Wildlife Area on Highway 38, you can be sure the Roosevelt elk have gathered on the other side of the fence. As I headed south for California two weeks ago, I got a double treat. The male elk had congregated near the road, calmly eating, scratching themselves and gazing at the people gazing at them. When I finished taking pictures, I drove to the westernmost parking lot to have a snack and discovered the females gathered there. More photos, of course. It was a beautiful day, with blue skies, sunshine and soft breezes. I had that first-day-of-vacation feeling when all the cares of home drop away and you’ve got plenty of time to relax. Dean Creek is only three miles off Highway 101 outside of Reedsport, with ample parking, plus restrooms, benches and interpretive signs. The preserve’s 1,040 acres of pastures, meadows, marshes and mountains are also home to beavers, muskrats, mallards, Canada geese, great blue herons, and other creatures. The elk are around all year, although you can’t always see them. But if you do, just be careful parking because people are watching the elk, not the road. Highway 38, which follows the Umpqua River from Reedsport to the town of Elkton, is a scenic road full of history. It’s worth traveling even if the elk are being shy that day. Click here for info about the Dean Creek Wildlife Area. More on this area next week.